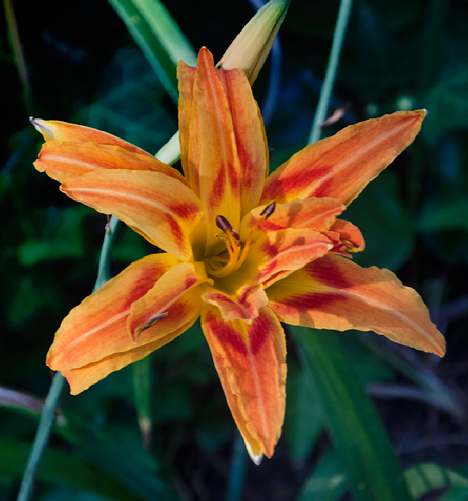 This dazzling Day Lily decorates our front yard. Usually when you see one, you see another. Not so with this lily. It is a loner and one day just popped up. I’m thinking the wind or a bird making a deposit near our front porch can claim credit for the poesy. Either way, I’m grateful for a good shot not involving sky-high gasoline to get it. Looking closer to home and finding some good stuff to see and shoot is the net result of our attempt to curb the pickup’s thirsty habits. It will go where others fear to venture and rides in creature comfort, but at a price. In a round-about way, we’ve made some discoveries we might not have pursued otherwise, while withholding funds from the gas pumps.We did not have to look far. Wonder what else we missed? Speaking of which, may we suggest that you go the Photo of the Week page at Corndancer dot-com where this epistle started. You’ll see other blooms and bugs and be regaled with the opening lines of this story. We’ll wait here. If you are from the south, you’ve always wondered what was lurking in the bottom part of a Magnolia tree which hugged the ground. (If you are not from the south, we’re sharing a shameful secret). You’ve ventured a few peeks, but it looks dark, dank, and threatening. Though your curiosity is consuming, your trepidation is in charge. You are looking at a fine magnolia tree a couple of houses down the street from us. Notice that the foliage goes all the way to Mother Earth. When most people take a closeup glance, their curiosity goads them to see what’s inside the tree. Spooky trepidation then takes over and few ever take a look. The wait is over. We are “fixin'” to reveal all. (Jaws music …) I entered the spooky inner sanctum of the Magnolia tree. To my delight I saw this cacophony of intertwining limbs, some taking root, as I tread soft carpet of old Magnolia leaves. It was like being in a mini-mangrove with no threat of alligators. Absolutely no apparitions or untoward creatures greeted me. If your children discover this, after that it will be a fight and footrace to keep them out. It’s like a natural jungle-gym. 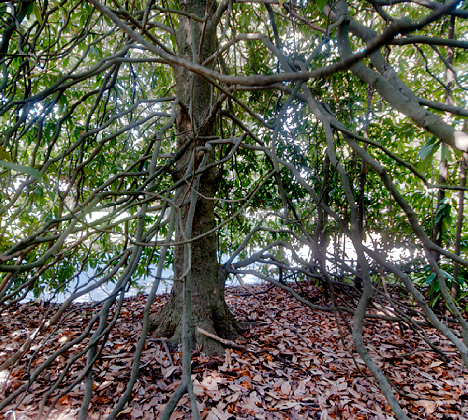 A benign tangle of limbs resembling a dry-land mangrove greets us at the base of this Magnolia tree. The expected apparitions and slimy creatures simply are not there. 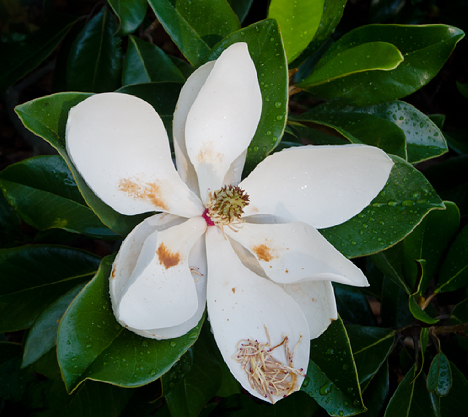 This a magnolia bloom. The tree is across the street from us. The tree above is not blooming. A yard sprinkler apparently knocked the filaments off the inner stem. The detached filaments collected in the lower petal. The bloom is nearly seven inches across. If you see blooms on the tree, it is a happy camper. Less than a half-mile from home is a small colony of Black-Eyed Susans which unbeknown to me prior to this investigation, provide nourishment and something to do during the day for a smattering of bugs. The insects were good enough to pose and go about their business despite my interloping in their routine. 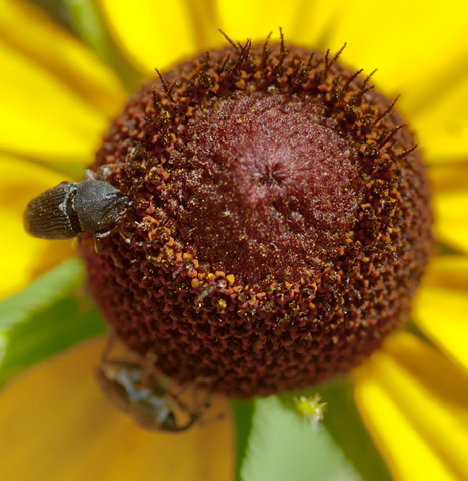 A banker’s stripe bug, a greenish-grayish bug out of the field of focus, and a small white mite of some sort are finding sanctuary on this Black-eyed Susan bloom. Whodathunkit? Just a few miles of four-lane from home is a favorite target. It seems that the signage across the front of our local Staples store has a magnetic attraction to sparrows. 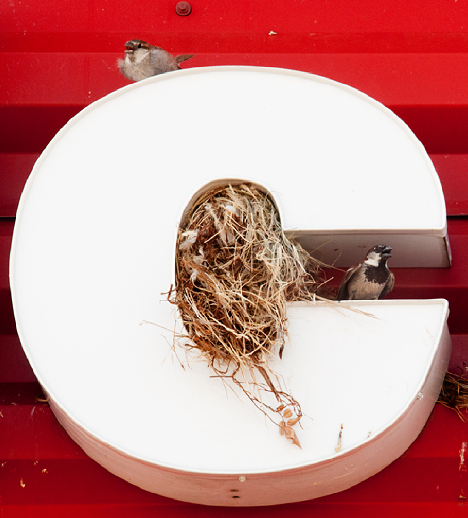 The nooks and crannies made by the Staples marketing emblazonry make for luxury accommodations if you happen to have a sparrow mindset. The sign side of the building is in the shade during the hottest part of our sweltering southern summer days which probably adds to the attraction for these feathery homesteaders. I’ve shot this before. The store folks clean out the nests, but the birds always come back. Looks like a losing battle but it makes for some cool pictures. Mrs, Sparrow (top bird), takes a breather from egg incubating duties which Mr. Sparrow stands guard. It appears that both are voicing a warning to say away from their immediate territory. Last winter, we were directed to a large honey comb dangling from a huge oak tree not far from our neighborhood. 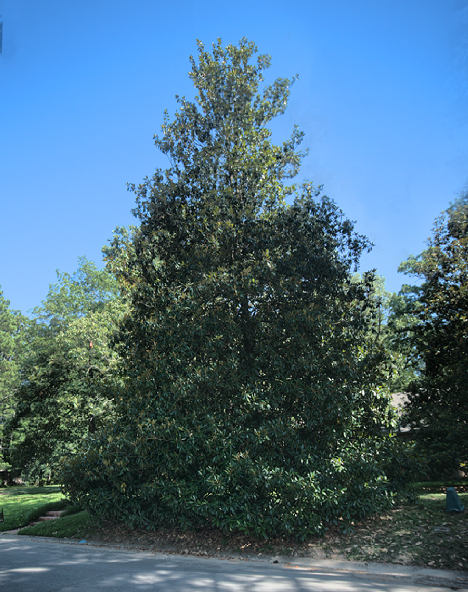 The tree is in the former back yard of our neighbor (the one with the Magnolia bloom). We have published a previous picture of the hive, but not when the tree’s foliage was present. The honeycomb is larger so our friendly local bees have been busy. But then, that’s what they are. Busy. 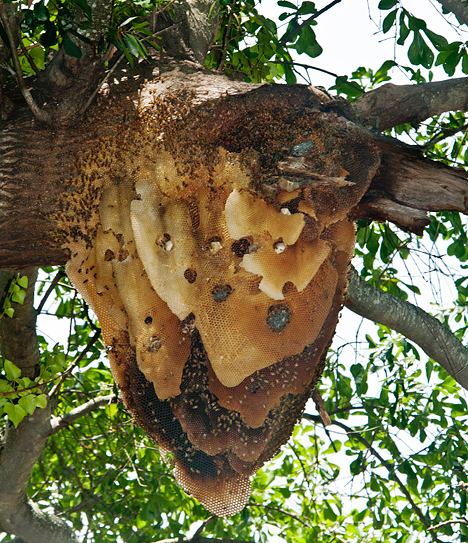 This huge honeycomb and hive hangs in a tree at 35th and Cherry, right here at home in river city, Pine Bluff, Arkansas. I estimate that the hive is nearly three feet in height. The bees are busy. Looking closer to home, we found a few opportunities previously unknown and a few old friends who we revisited with good results. It’s a good day when you reap good results from circumstances you would like to have avoided. We need all of those we can get. You’ll find 45 high resolution pictures from this same shoot. More bugs, more bees, more birds, more blooms. The pictures are larger and are captioned to give you a bit of information about what you are seeing. For these stories, we shot more keepers than we had room to publish so into the gallery they go. Take a look. This little pond on Farm-to-Market Road in Cleveland County, Arkansas is probably a primordial soup of a small universe. 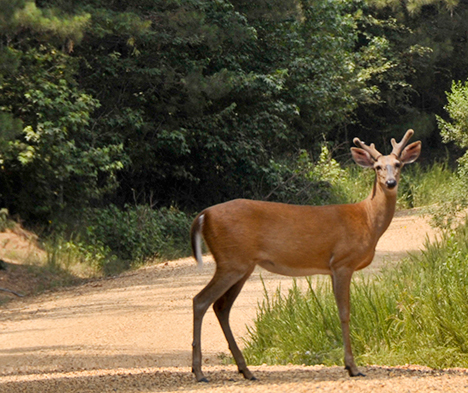 It is no doubt full of critters and in the mornings and late evening is probably a popular watering hole for local wildlife which is abundant in Cleveland County. It looks like a simple pond, but it is a small universe of interdependent creatures in and out of the water. Our lives, like the pond, conceal more than is revealed. As we gaze, we look inside ourselves. As we ponder the reflection of the pond, our inner reflection circuits are energized. 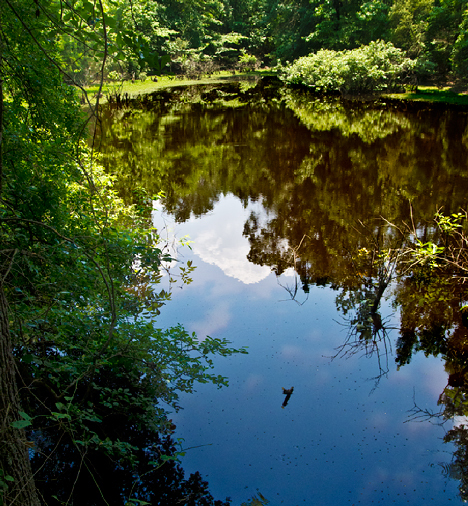 We compare the inner complexity of the pond’s diverse environment to our own experiences. As you gaze at the pond, the reverse crystal ball kicks in and you reflect on from whence you came. Following that intriguing observation, may I suggest that you go to the Photo of the Week Page at Corndancer dot com and take a look more pictures and ideas about where this exploration of reflections started. We’ll wait here until you get back. 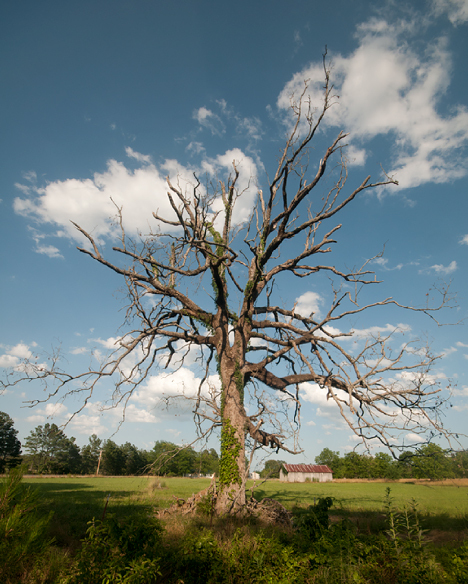 Moving right along, in neighboring Lincoln County, Arkansas we found this cool old oak tree, which has long since met its demise. The sun, the clouds, the tree and the barn were just right. Sometimes, you just get lucky. Even in death, the tree is still an imposing image spreading its scruffy limbs against an azure sky dotted with cottony clouds. 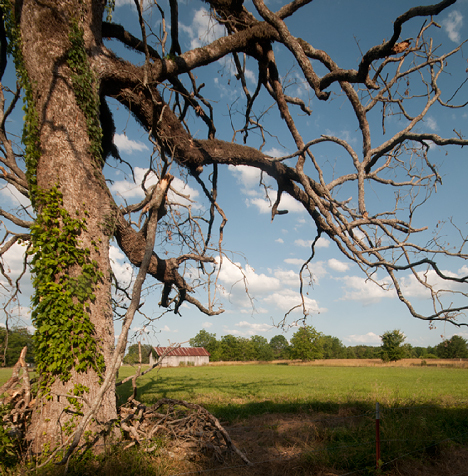 Perhaps when the barn in the background was abandoned the tree threw in the towel at the same time. A tighter view lets you see the complexity of the limbs. This will be a spooky place on a moonlit Halloween night. 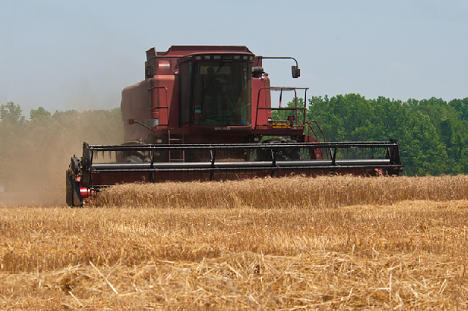 Closer to home, a week or so back, local farmers began to harvest winter wheat. They plant their wheat, a hardy plant, in the late fall and early winter after they harvest their soybeans or other summer and early fall crops. Snow, ice and other untoward manifestations by Mother Nature do not seem to phase it. My farmer stepson tells me that wheat is ready to harvest when the heads begin to curl. This is ready to go. You can see the downward curl. This is flour before Pillsbury gets to it. Wheat now grows where cotton was once king in the south. Like a lot of other American industries, cotton production has moved outside our boundaries. A large cotton gin in a neighboring town recently closed it doors. A Mexican agricultural company bought the equipment in the gin, disassembled it and moved it to one of their gins south of the border. We have high hopes that this trend does not continue. This wheat field, ready to harvest, was a cotton field in past years. 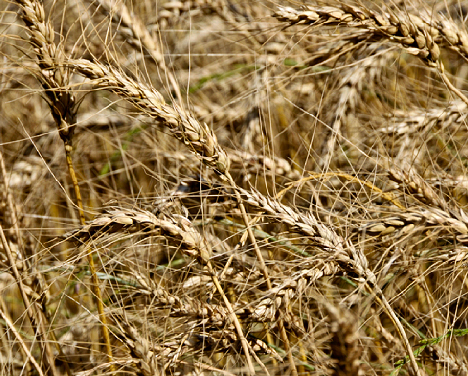 Wheat is harvested by a combine. The huge machine cuts the wheat, swallows it into its gaping maw, shakes the snot out of it, and spits stalks and trash out the back of the machine while it deposits grain in its hopper. The machines are big, expensive and very complex. Combines are as big as a small house and cost in the low to mid six-figure range. Most farmers will tell you that when you crank 'em up, they immediately begin to shake themselves to pieces. It's the nature of the beast. Once winter wheat is harvested, the race is on to clean up the fields, sometime by burning, and make the Delta soil ready for planting soy beans. They like to complete their soy bean planting in June. Come October and November, farmers will harvest their soybeans using the same combines with which they grabbed their wheat — and then get ready to plant more wheat where the beans were. Life goes on. 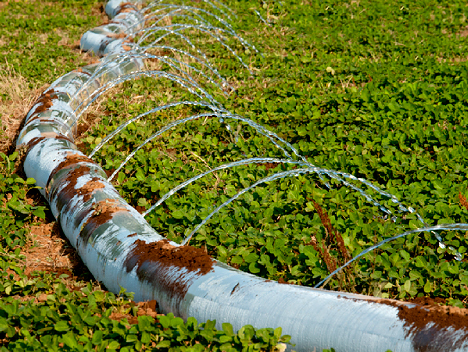 The abundance of moisture left by massive spring rains has long since evaporated and soybean farmers are now irrigating their crops. The pipe is collapsible plastic. Pressure from the well pump to which it is attached inflates it. Farmers punch a hole in the plastic for each row to be irrigated. Less than two months ago, the fields which now require irrigation were sticky mud from spring rains. 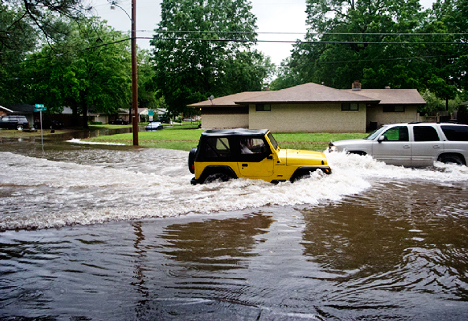 Local supplications to the Almighty to meter rains out on a more convenient schedule have thus far gone unheeded. Less than two months ago, we had more water than we could possibly use. Now it's back to the wells to keep the crops growing. These city streets are just a few blocks from the Chez Dempsey and only a few miles from the bean fields you see above. Wonder if that jeep would pull skis? Thanks for joining us as we meandered around this end of the world exploring our problems, opportunities, and some of the neat stuff you may not see anywhere else. Be sure and see our Weekly Grist Gallery with larger high resolution pictures of our shots this week. The camera is level, the barn is not. Someday soon, an ill wind, a rotting structural member losing its final strength, a termite banquet, or other untoward circumstances will spell the endgame for this fine old barn. There will probably be no human witnesses. And passers-by may not notice the collapse until weeks later. What was once pride and joy will be a pile of rubble. 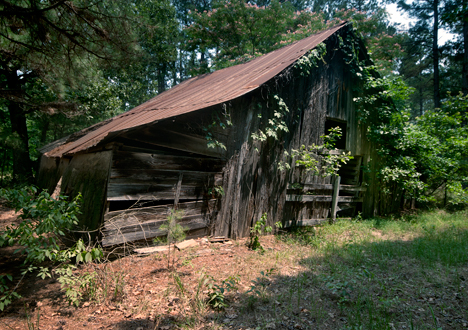 At a sharp bend in Prairie Road in Cleveland County, Arkansas I spied this old barn coming close to losing its extended battle with gravity and age. Had the builders done less of their jobs, we might be looking at a pile of barn boards instead of a precariously surviving structure. There’s still enough left for an impromptu glimpse of rural history in an agricultural community. Before we pursue this tale further, may I suggest that you take a look at the Photo of the Week page at Corndancer dot-com where the story started. You’ll see an old home place with some interesting trees less than a mile from this barn. The old barn was no doubt built in stages. The idea was basic utility first, add on as soon as you have a good year and then expand your capabilities to support a growing family. A family’s barn was the epicenter of subsistence and production for income. There are probably a few remnants of a home nearby that did not grab my attention. At the time of this structure, absentee farm ownership was not yet in vogue. 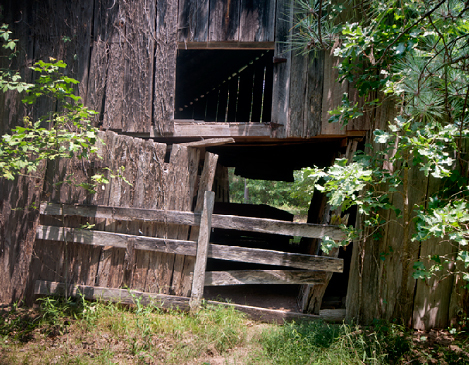 This is a horse or mule barn with a door tall enough to accommodate a man on a horse or mule. The loft stored hay for the winter and according to legend, was a place for some friendly encounters. They say. The rough-hewn looks of the lumber means the owner operated or hired someone to run a temporary sawmill close by to produce lumber from trees felled close by. It was a common practice since trips to town for lumber took days not hours. I was not far from New Edinburg, Arkansas, home of the McClellan’s Country Store, the proprietors of which will build you a fine sandwich. It was early afternoon and my Cheerios and yogurt breakfast was a long time back. Stephen McClellan did the honors. The ham-turkey sandwich laced with home-grown tomatoes plus the other traditional sandwich decorations met my wildest dreams in size and palate-pleasing yumminess. I washed it down with a Barq’s Root Beer in a long-neck bottle. Before I left, I bought a few home-grown tomatoes as well. See more pictures from Prairie Road and thereabouts at our Weekly Grist Gallery. 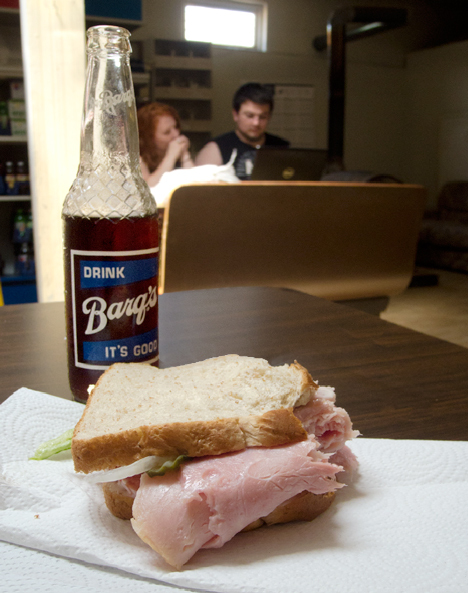 A Barq's and a great sandwich with a bite missing are the signs of a great lunch in progress. In the backgound, (left to right) Kristin Skelton and Stephen McClellan are looking at a previous Weekly Grist post while I am munching out. One cannot help but snicker occasionally as you travel about. 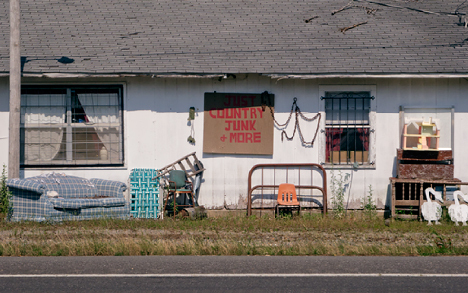 Just south of Pine Bluff, Arkansas on U.S. Highway 63 is a store at which the proprietors display some of the merchandise in the front yard 24/7 /365. If I ever pass it when it is open, I will probably satisfy my curiosity and peruse the innards of the establishment, but for the time being, external observation is my limit. The sign says "Just country junk and more." I can see the junk, but not the more. The way home from Prairie Road takes me north on U.S. Highway 79. As of this writing, for more than a week, a couch has been sitting on the shoulder of the highway south of Pine Bluff, Arkansas, my home town. I posted a picture of the couch on Facebook and of course it has drawn the wit expected on such a post. Here for your viewing pleasure is the couch on the side of the road. Or should I call it a divan? 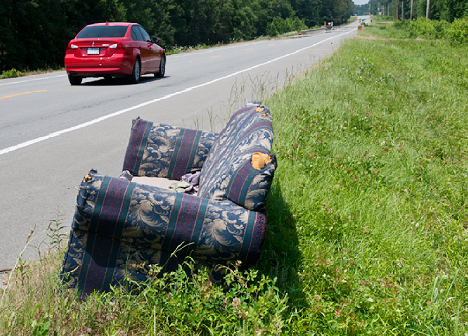 This old sofa just barely off the shoulder and in the right-of-way on the north-bound side of U.S. Highway 79 south of Pine Bluff, Arkansas has been sitting there now for more than a week. Wonder how the highway department people have missed it? It's not camouflaged. See more pictures from Prairie Road and our recent meanderings through the hinterlands in our Weekly Grist Gallery. See an old store, another view of the big catalpa tree, a big woodpile and more. You can tell when you see the first vestiges of Marks Cemetery that it's not going to be an average country last resting place. 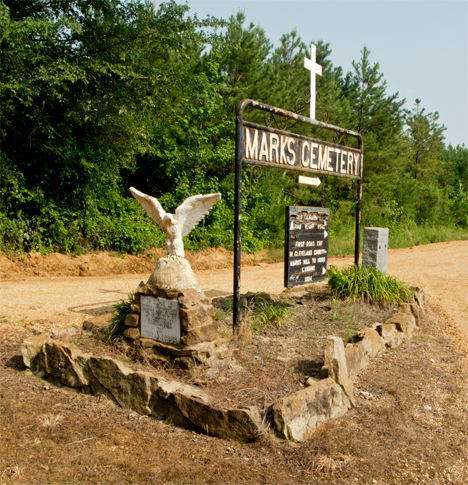 Marks Cemetery in Cleveland County, Arkansas is worth the trip. If you are a history nut, put it on your bucket list. If you simply want to see something you won’t see anywhere else, it fills the bill. 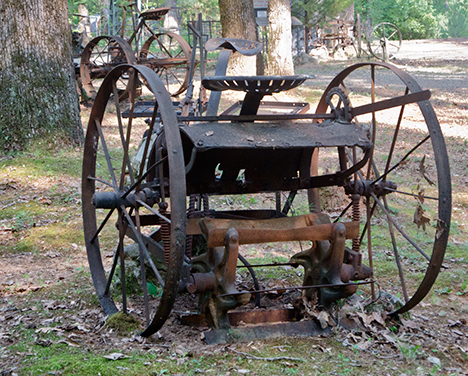 It’s kind of a park and kind of an outdoor museum carved out the southeast Arkansas boondocks. If you can wangle an invitation, the best time to visit the site is for a few hours on the first Sunday morning in June when the Marks descendants gather for their annual family reunion an event dating back to 1877. More than one of these family members can regale you with historic tidbits, which others will corroborate with a reasonable degree of accuracy. You will also eat well. Very well. Speaking of eating, before we go too much further, may I direct you the start of this story on the Photo of the Week Page at Corndancer dot-com. We’ll wait here until you return. As you enter the cemetery grounds you run up on this historical marker at Salt Branch, a lazy little stream which meanders around the grounds. The marker bears a quote from the Cleveland County Herald, in a story on the Battle of Marks Mill: "So many horses and soldiers were killed that Salt Branch ran red with blood." In the battle Confederate forces ambushed a Union Supply train and captured more than 1,000 prisoners. Most of the acreage around the well-tended cemetery is unique. It was smack-dab in the middle of the legendary battleground of the Battle of Marks Mill site during the War Between the States. The Marks family had called the area home for 28 years when the battle took place on April 25, 1862. By the 1950s, the family cemetery had gone the way of many other rural places of final rest after family members moved “to town” or out of the state. It showed evidence of overgrowth and neglect. Some family members imbued with a good case of well placed righteous indignation decided enough was enough and got the group organized to clean it up and maintain that status. See more reunion and ground pictures in our Weekly Grist Gallery. This is a horse-drawn tobacco planter. The plaque reads, "Purchased in Nashville, Tenessee. Used in the late 1800s to early 1900s. Brought to AR by Knowlton Broach to plant sweet potato slips. Edgar Colvin 4-2002." Along the way, some brilliant Marks descendant minds decided that since this place was of historic value, why not sprinkle the landscape with historic artifacts, memorials, and informational plaques. Once the idea took wings, it engaged a ratchet and placement of historic accoutrements and thingamajigs continues. The latest entries are a couple of unknown soldier monuments standing side-by-side on the entrance road to the cemetery placed in September 2010 by Edgar and Sue Colvin (she’s a Marks, he married in). Appropriately, one monument memorializes Confederate Soldiers and the other reverently remembers Union Soldiers. Nobody is taking sides now, just respecting history. This old horse drawn stalk cutter is near the cemetery entrance. The blade and mechanical setup is similar to a reel type lawnmower. 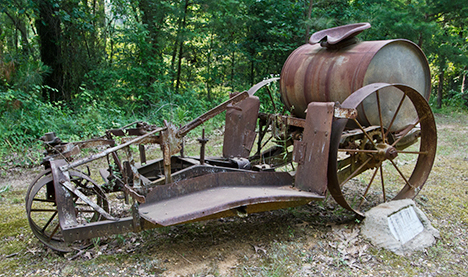 You won’t find a lot of Civil War cannons and other war left-overs at the site, but you will find a treasure trove of old horse-drawn farm implements including, a row-crop planter, a couple of mowers, a hay rake, a bulbous tobacco planter, and a bunch more. You’ll also see an old railroad switch doo-dad with a nearby short section of track festooned with a cattle guard that looks like a medieval torture device. This young buck gives me a curious look. I had just completed shooting a huge Catalpa tree which will see in a future post, when I looked up and saw him. By the time I grabbed the camera with the long lens, he was long gone. 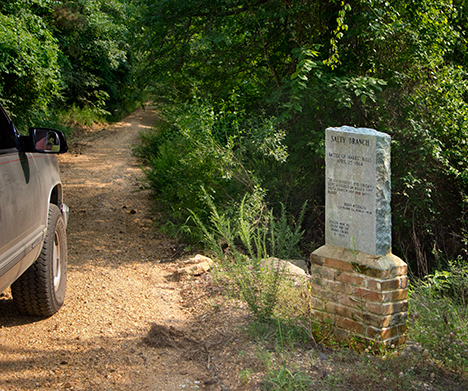 The location was Prairie Road in Cleveland County, Arkansas. Though the site is listed on the National Register of Historic Places, all of the improvements, artifacts, additions, maintenance and use of the land are placed, privately funded and supported by like minded individuals who believe there is great value to the site. The gallons of sweat equity that have and continue to fuel this hallowed place are astronomical. It’s a testimonial to a family that places a premium on being who they are and knowing where they came from. See more pictures in our Weekly Grist gallery. More reunion. More grounds. 28 high resolution pictures in all. We shot more reunion pictures than we had room for in this article, so we’ve put all of the keeper pictures, with captions, in our weekly on-line gallery.